It’s taken me years, but I’ve finally found a method for writing content that gets 100s of shares. I’m not saying it’s the only method, or even the best method. But it’s reliable and repeatable, and those are the most important things. Here’s what happened to our traffic when we started executing this. I’m going to explain in 3 simple steps how I (and you) can generate content that gets 100s of social shares. It could even be your next post. A successful post starts with proper planning. I know it sounds cliche, but the fact is most cliches are true – it’s just that people hear them all the time and still ignore them, and therefore feel the need to classify them as cliches (which gives them another reason to ignore them later on). When I just write a post out of nowhere, usually the result of a burst of inspiration, they never perform all that well. Now, sometimes just for the sake of enjoyment it’s good to run with the wind a bit, but if your long-term goal is to drive traffic to your website, you have to take the time to plan. Results don’t happen by accident. So, what do you plan? There’s a few important questions to answer before you get started writing (but before you answer these, read the entire post, because it will influence the way you think). What problem or question is my post going to solve? How am I going to display the information? How am I going to include dozens of influencers? The last question might be the one that takes you by surprise a bit, and it leads me to my next point. Of all the steps, this is the most critical. It’s the secret sauce. The influencers are the ones who carry the post. I’ve seen and read a lot of great content, and it’s often the great content that didn’t incorporate influencers that I always feel is sitting on the sidelines, not getting the exposure it deserves. This is particularly true if the blog itself doesn’t have a ton of traffic. On the contrary, articles that include dozens of influencers almost always perform well, on any blog. Now, believe it or not, there is a method for including a lot of influencers in a post. Again, it doesn’t just happen. Here are a few examples. These epic posts often end up being over 10k words, which allows them to rank nicely for a lot of long tail keywords. The entire point of these posts is to feature influencers. Some posts sole purpose in life is to highlight other resources or posts – it’s a noble existence. For example, on Backlinko, Brian features The Definitive Guide To Linkbuilding as one of his primary resources on his sidebar. Yes there is some unique content, but the crux of the post is the dozens of useful guides he’s curated under selected categories. Mind you, these are links to posts other people have written. I’ve done this myself with 126 Traffic Generation Case Studies. Despite the relatively little content of that post, it still managed to generate over 300 social shares and thousands of visitors to our post. The reason is because it featured over 100 influencers. Basically, any collection of related URLs works. Yes, there is a third option where you actually write a normal post, but you just improve it by giving it some extra leverage. A perfect example is Hacking Triberr – How I Got A 6 Million Reach In Two Weeks With 80 Twitter Followers. This is a nice case study and it’s an example of the great content I see from time to time that under normal circumstances would go unloved. 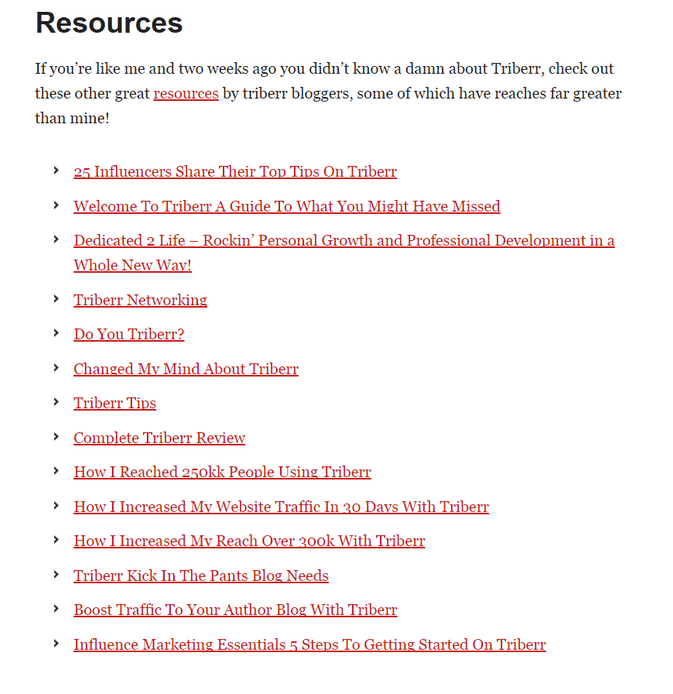 Simply acknowledging that this post was about Triberr, and adding a resources section at the end filled with Triberr related articles, was a great way to feature a ton of influencers without just completely link bombing the core content (which could have been distracting to the reader). It’s not enough to simply include influencers, you have to let them know about it. Sometimes, like in the expert round up example, they’re expecting to hear from you. And other times, they aren’t. But in all cases, they’re happy because they’ve just been linked it. Just wanted to pop in and say that we’ve included you in our round up of top SEO tools. Thanks for providing a valuable service, and if you feel inclined to share the post with your audience, we appreciate the exposure. It’s simple and to the point – no need to ramble on and on for something like this. If you’re wondering why no one is reading your posts, you’re probably missing one of the above three ingredients. Luckily, this is easy to fix. In fact, you can actually go back and retroactively add influencers to the post in order to allow yourself to reach out to them. Seriously – why not? It’s not breaking the rules or anything. You can revive old posts this way, and strategize for new posts as well. Do you include influencers in your posts? (Update - Dave no longer runs these websites, but can be found at lesschurn.io and daveschneider.me). A lot of us fail to realize how important it is to involve other people in our posts… and promotion? Practically 90% of the bloggers right now dont promote their content at all so you are dead-on. Great points and congratulations on growing Ninja Outreach man! Keep it up! I didn’t know about influencers. Thats something of value i have learned today. i’ll start implementing that. I definitely agree with you on the planning part. Promotion is something that a lot of bloggers leave out. Most of us publish and leave it at that. “Experts roundup posts” are the new trendy way to gain links, Avitus! This is my visit to your site and I really foud this article useful for me. I agree with you that without promoting your content you will not able to get a good traffic for your blog because with the increase in popularity of social networking sites it’s very difficult to get organic traffic so it is important to promote the content to get traffic.so I will try out these 3 steps for my upcoming posts. Dave was contributor with this post at NoPassiveIncome blog. Thanks for your feedback, Leena. I’m very glad you liked it, Leena! Plain it out – yes, the significance of planning your work ensures that you are staying on track with your goals and you can ensure that you become more task oriented. The three questions are some guides to make things well created. “On the contrary, articles that include dozens of influencers almost always perform well, on any blog.” I couldn’t agree more. Blogs that shares or contains list of influencers in their posts generally receive a high traffic and good impression to readers and influencers. People will carry on sharing your post and the number of shares will increase continuously, only if the post provides accurate and dependable information. I think Dave added an awesome contribution here. The point of inviting influences to participate to a roundup post, or simply mentioning them in a post is a great idea. Also, letting them know about the mention, with an email or a tweet, helps a lot. Well, it would be important to try or test these methods. The ingredients are easily practicable but the result would depend on the discipline and value explored. Getting hundreds of shares from a well planned content is feasible. I guess it would be important to practically apply the steps shared! It’s like when people say that “blogging is easy”, or “making money online”. You need to put the right amount of dedication and passion to make things work just fine. Thanks for visiting and commenting, Sunday. Nice to see Dave’s post here. A very informative and educative post for all bloggers. Yes, the 3 tips or steps mentioned in this post is vital for any bloggers If follow well, there is no doubt you can get a great traffic to your pages. Yes, Planning is an essential and for that matter, it is very essential for any venture. As you said: “Results don’t happen by accident.” Yes, our planning, efforts, hard work follow-up promotion all are interlinked with that. Step # 2 is indeed another very important to pull traffic to our pages, including influencers post in a single post can do wonders. Share mechanism is more here, since all want others to know about their posts mentioned in other posts, and the chain continues and ultimately the traffic flows into our pages. Export round up post is a good idea to pull traffic. And lastly the promotion part, many of the bloggers fail in this area to get traffic to their posts, many bloggers they publish wonderful and valuable posts, but alas the readers are very few sometimes his or her close associates or relatives, that ends there of a great post. Promotion thru social media is a must to pull more traffic and share of our pages. The connected links mentioned in the post are relevant to the subject, I just bookmarked it for my further reference and share. Nice to be here. Thanks for sharing. glad you enjoyed the awesome contribution of Dave. have a great res tof this week. Yes, linking out to influencers is the secret-sauce to getting a post viral and even managing to get some backlinks. I did a round-up earlier this year on our GuestCrew blog that went on to get 1.7k+ shares and it still receive a dozzen tweets everyday. I guess the tweetable quotes have helped as well. I haven’t thought about editing old posts and adding influencer resources and doing out reach on it, that is surely a new idea I can start working on right away. Thank you for the action-able tip. a round up of influencers will definitely benefit your site traffic and reputation. You described the relationship building concept very well. This tactic is being used by many of expert bloggers. It is very useful for me. I am newbie blogger and am trying to write long articles. One new things that I come to know through this blog post is that Resource Guides. I was not linking to the resources. This could be really helpful to grab traffic. I am going to apply it from now…. Dave nailed it with his guest post. I’m getting many invites to participate to experts roundups. It’s a great way to share your expertise, while being featured around blogosphere and increasing your authority. By the way, have you checked my “About” page? You can see all the interviews and roundups I participated. Very Useful and Mind Blowing Informative Article , I guess creative and informative article will surely get good shares. An impressive and interesting information about writing content that how to shared in different ways, and all kinds of information is such admirable and further forward this links to my friends. Angelina, that’s a post written by Dave, thanks for your kind feedback. Expert roundups have earned me many great links in the past. Although in some niches, it is very difficult to find experts who are willing to work with you, it definitely works with most niches.